Brining a pork roast will make it infinitely more juicy and flavorful. It is easy to prepare the night before and put in the oven just before dinner. In a large pan, mix together water, salt and sugar. Cook over medium heat until salt and sugar have dissolved. Add bay leaves, garlic and pepper corns. Cool brining mixture in the fridge until room temp or cooler. 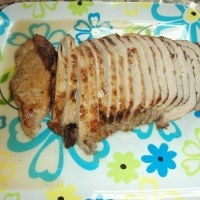 Place pork loin into brine in a container or ziploc bag that allows the roast to be completely submerged. 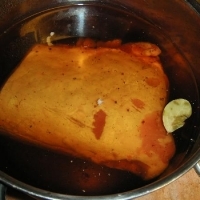 Allow the roast soak in the brine at least 8 hours, or overnight (overnight is better). 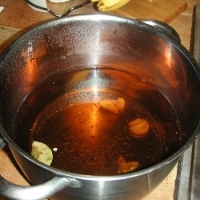 Remove the roast from the brine and pat dry. In a non-stick pan, heat oil over medium high heat until shimmering. Add the pork loin to the pan and sear on all sides, allowing a nice brown crust to form. Put roast into a roasting pan. Cook until internal temperature registers 140oF (approximate an hour to an hour and a quarter). Allow roast to rest under a foil tent, approximately 10 minutes. 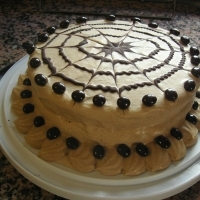 A winning recipe! I prepared it exactly according to the instructions except that I baked the pork to 160 deg. instead of 140, per the instructions on my meat thermometer. I also brined it a full 24 hours. It came out moist and full of flavor. Served it with a baked potato one night, then risotto the next. Wrapped the last of it in a whole wheat tortilla with fresh veggies. A flavorful, lean, versatile protein choice that I'll be making again very soon. How much salt, a 1/4 what? Does all ingredients get added to the brine or are some added later? I only saw the salt and the sugar being used and I noticed the bay leave in the picture. How about the peppercorns and garlic?